The Grand Hotel Ukraine is located in the very center of Dnepropetrovsk and near Troitska Church, Russian Drama Theatre, Museum of Art. 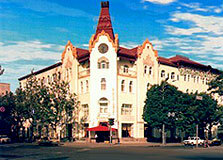 The Grand Hotel Ukraine was built in 1910 and was last renovated in 1997. 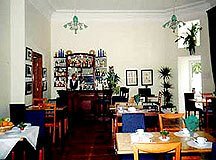 Nowadays, the hotel offers high quality service to meet Western standards and travelers' expectations. 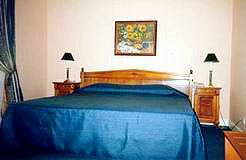 Also available are restaurant, bar, casino and a business center, offering free Internet access. 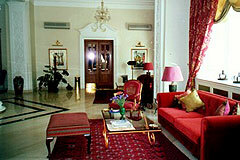 All rooms have luxurious furniture, TV, phone, mini-bar and exquisite decoration. The Grand Hotel Restaurant is ready to offer you a wide choice of Chinese and Japanese dishes as well as European and Ukrainian Cuisine. Always caring for your health, Grand Hotel Ukraine Health Club offers several treatment and regeneration possibilities like swimming pool, Jacuzzi or sauna. 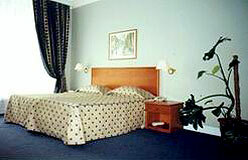 The use of the Grand Hotel swimming pool, sauna, Jacuzzi and fitness centre is included in the room rates. Park of Shevchenko - 3.1 miles, Historical Museum - 2.5 miles, Museum of Art - 1.9 miles, Sviato-Preobrazhenskiy Cathedral - 2.5 miles, Opera and Ballet Theatre - 1.9 miles. Nearest metro station: Vokzalna. Airport - 8.7 miles (14 km. ); Railway station - 1.5 miles (2.5 km. ); River terminal - 2.2 miles (3.5 km. ).